Perth and Kinross is a county in the north east of Scotland. Everyone native to Perthshire speaks English to a highly comprehendable standard. The local dialects are widley regarded as some of the most understandable in Scotland (unlike nearby Dundee). Gaelic is not widely spoken in the area. 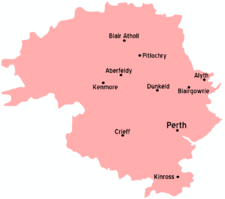 Due to EU law a large number of Eastern European (mainly Polish) Workers emigrate to Perthshire to work on the fresh fruit farms north of Perth. Many of the migrants have little or no English. Perthshire has one of the most developed bus infastructure networks in the UK, largely run by transport giant Stagecoach, who have their offices in Perth. They opperate many services linking all local communities. At peak time on weekdays busses can run as often as once every 5 minutes but on Sundays servce can be much slower. Check the online timetables before planning a day out. If you miss a bus from a rural area their will usually be another one later, just how later can vary. Bus travel is normally safe but can get intimadating on Friday or Satuarday nights. It is advised not to travel by bus after dark if you are unfamiliar with the route. This page was last edited on 1 April 2019, at 13:08.